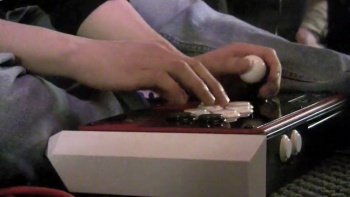 I Got Next, a documentary about Street Fighter IV and the fighting game scene, will premiere this Friday via a webcast. We got an advance look at the movie, and yes, it's full of delicious fighting game drama. The success of Street Fighter IV has proven that gamers still love their fireballs and hurricane kicks as much as their space marines and plasma rifles, but there's still a lot more to Street Fighter than battling legions of scrubby Ken players on Xbox Live and PlayStation Network. The competitive Street Fighter scene, where world-class players battle it out in tournaments across the world, is still something of an unknown to most gamers. That's where I Got Next, a full-length documentary about amateur and professional competitive Street Fighter IV players, comes in. Premiering this Friday via a live stream on UFragTV, the film sheds light on this scene and the diverse cast of characters populating it. For Ian Cofino, the recent college grad who started the film as a senior project but has since expanded it into a full-fledged feature film, I Got Next isn't just about the intense drama of seeing the East Coast's best Sagat taking on a SoCal Balrog - it's about the people. "I tried my best to capture those moments of excitement, and to recreate the tension at a tournament in the film," he said. "While the film is punctuated with that hype, what I think it delivers also on is stories of multidimensional characters." I got a sneak peek at Cofino's finished cut of I Got Next, and I can safely say that these people definitely are characters, from recently crowned national champion Justin Wong to Ryan "Gootecks" Gutierrez, whose boundless enthusiasm and passion for the game's potential have driven him to reorient his entire life around the pursuit of Street Fighter glory. While Wong gives the impression of a pure gaming savant, Gutierrez comes off as something of a Jay Gatsby of competitive gaming - someone who's in the midst of chasing a dream after completely remaking himself for it (he says he suffered a 'quarter-life crisis" which led him to dump everything he had and devote himself to Street Fighter), who you admire for his guts but can't help but feel a bit worried about. So yes, you really get a good look at these people. The film's also full of slick visuals (Cofino's design school training shines), raucous tournament footage, and a few surprisingly poignant moments (Joe "iloveu" Ciaramelli's touching family history) that you don't expect in a movie about videogames. It does feel a bit unfinished. You get a taste of character arcs - Wong's attempt to truly make himself into a Michael Jordan of gaming, the question of whether Gutierrez's gamble to follow this dream's really going to pay off, Ciaramelli's dilemma over whether or not to go pro - but there's a feeling of loose ends by the time the credits roll. That might be because, in a sense, the film actually isn't done. Cofino is planning on releasing a feature-length version of the film (the current cut is around 45 minutes) later this year, which will add footage he's shot and plans to shoot, particularly from next month's EVO tournament, which will bring the best players from around the globe and should make for an adequately epic centerpiece for the final cut. Not that the short version of I Got Next isn't worth watching - this is a fun, accessible and insightful flick, and should easily earn a rep as the King of Kong of fighting games. I Got Next will premiere on Friday at 8 PM EST over at UfragTV, and feature a live Q&A with Cofino and some of the players featured in the movie afterward. Awesome, I've been looking forward to this. Don't know if I'm going to watch the short version though. I might wait until the feature length cut is put together with the footage from EVO. After the trailer premiered I actually got really interested in trying to compete in SFIV tournaments...but there are no tournaments, no lan houses, and no imported SFIV arcade machines anywhere in my state. So that unfortunately can't happen. I got to meet "Gootecks" at a SF4 Tournament in Ventura County. Nice guy and certainly knows his stuff when playing Street fighter. I don't know if I'd want to watch a documentary with drama over a video game but for those that dedicate themselves to this electronic craft certainly struggle. I will not watch this. I liked The King of Kong, but thats because 1) Donkey kong is awesome and 2) Steve Wiebe is awesome. I'm sure it will be interesting, but I will not watch it unless like G4 gets it some how than I might. If Daigo isn't in it, I don't care. Being that Justin Wong is in it, I care even less. From what I've seen from EVO Moment #37, Justin's style consists of extraordinary turtle-ness. I don't know about the documentary itself, but I will give it props for having the best video-game related documentary title EVER! I really would not base my opinion of the guy's entire style around a single round of a single match. Wong is actually a pretty versatile player (see him play Rufus in SF4, a character based on pressuring your opponent, Abel is a bit more of a turtling character but not too bad there either). You should see Ricky Ortiz. Now there's an extraordinary turtle. Actually, I was going by all of the rounds of that match, but I see your point. M'kay. It's always fun being ushered out of ignorance.